My parents live in Florida, and whenever I visit, my dad always asks me if I have any cash on me. It’s not that he needs to borrow some; it’s quite the opposite. My dad firmly believes in carrying cash in case of the unexpected. In response, 9 times out of 10, I tell my dad that I do not have any cash. He usually slips me a twenty dollar bill. My dad is right to be concerned that I never carry around any cash. As a safety precaution, we all should carry some cash in case of an emergency. I’m not saying that you need to carry a lot; you certainly wouldn’t want to get robbed or lose any of it. However, in a world where people only use cards, cash is still king. Here are 8 reasons why you should always carry some cash. Eating out and splitting the bill with friends or roommates? Some restaurants may be able to print out separate checks, but it is much easier and timely to pay as a single party. Similarly, if you and a shopping buddy split a purchase, it’s easier to do so with cash. Otherwise, one person might get stuck with the whole cost if the other promises (and forgets) to reimburse later on. Also, written checks might cause an inconvenient trip to the bank or an ATM. My sister-in-law is a server at an amazing restaurant, and she has told me that she prefers cash tips over credit. If she gets a cash tip, it is all hers. While she does give some money to her busser, it does not go through management, which takes its own cut on tips given in credit. If you know you will be dining out at a sit-down restaurant, make sure you bring some $1 bills for proper tipping etiquette. It seems as though you can use credit or debit cards pretty much anywhere these days. And for the most part, this is true. However, there are some places that only accept cash. For example, I was once in a taxi van going to the airport, and to my surprise, they only accepted cash. The whole van of people had to wait for me to pull cash out of an ATM. Needless to say, they were not too pleased with me. Vending machines are another example of these rare cash-only moments. Yes, some vending machines do take cards, but the majority of machines do not. Sometimes when you are thirsty, it is necessary to use a vending machine to get a drink, especially after a work out. My mom and I always bring a few dollars with us when we go running in the park. You never know what can happen, so you always need to be prepared. If you are going on a road trip, and you don’t have a AAA membership or some other road side service, you need to make sure you have enough cash to pay a tow truck. Having cash at hand is one of the more important travel safety tips. Although some emergency service providers accept credit cards, you never know when your card might let you down. What if your payment won’t go through? Perhaps your credit card company suspects fraudulent charges and suspends your card. Hopefully you didn’t reach your spending limit (remember the Golden Rule of credit cards!). If you are trying to use a debit card, what if you have insufficient funds? Don’t depend too heavily on your plastic – you may find yourself in a tight spot. Believe it or not, more Americans are saying no to credit cards and using cash instead. If you live by the envelope budgeting system as a means to getting out of debt, you must have the cash on you. Otherwise, you won’t get very far with your budgeting and will find yourself constantly overspending. One of the reasons that this methodology is effective is because you see the money physically being spent or saved. This cannot be done without cash. Alternatively, you can follow this same strategy using an online money management tool like Mvelopes. When I traveled to Orlando a few months ago, I had to take several toll roads. Even though I knew I needed to take them, I forgot to plan ahead. When the time came for the drive, I had absolutely zero cash on me. For each of the 5 toll plazas I went through, I had to fill out paperwork and send a reimbursement to the Florida DOT after the trip. The whole situation could have been avoided if I had cash with me at the time. I have a friend who always carries a twenty dollar bill just in case he gets mugged. His hope is that if he gives the mugger the $20, he will be left alone and the mugger will be satisfied. I have no idea whether or not this actually works, but I would much rather give a mugger a $20 than my credit or debit card! 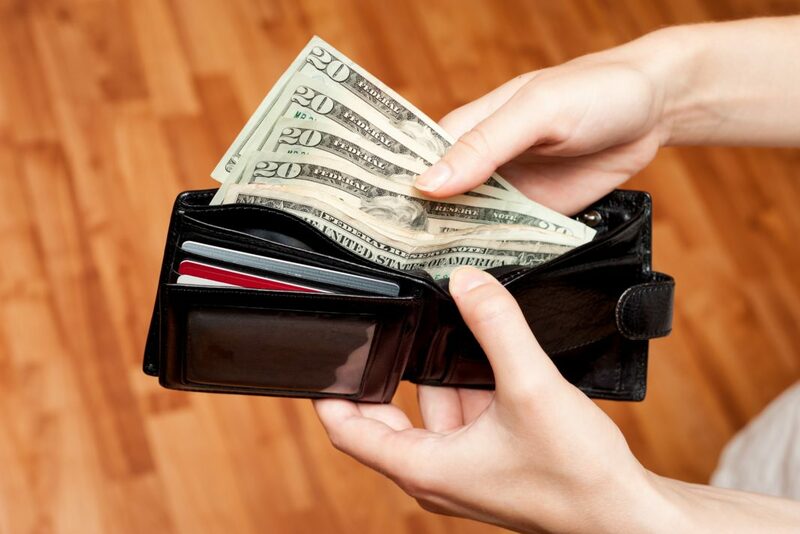 Do you carry cash with you in your purse or wallet? How about in your glove compartment? How much do you usually take with you?